Since making Raleigh her home, Ashley has sought to foster community through food, philanthropy and the stimulation of the city's downtown neighborhood. Ashley begain cooking during college, throwing dinner parties for her friends and family. These intimate gatherings helped her recognize her passion for cooking and sharing food, and ultimately, led to her first professional cooking job at the age of 21. Upon taking the position, she knew she had found her life's work. After working with some of the Triangle's top kitchens, Ashley opened Poole's Diner in 2007, which takes its name and decor from the building's original tenant - one of downtown Raleigh's first restaurants. In 2011, Ashley opened three new ventures, all housed in a corner building once occupied by a Piggly Wiggly. Beasley's Chicken + Honey is an ode to fried chicken and classic southern sides; Chuck's offers burgers and frites with signature updates; and Fox Liquor Bar, housed in the building basement, features a menu of more than 50 craft cocktails, as well as beer, wine and bar snacks. When she is not in the kitchen, Ashley focuses her time on a number of local and regional charities. She is a board member of the Frankie Lemmon Foundation and a co-chair of its annual fundraising event, Triangle Wine Experience. She is also an active member of the Southern Foodways Alliance and founded the yearly event, Stir the Pot, in which she hosts visiting chefs at Poole's and in her home to raise funds for the SFA's documentary initiatives. Ashley's work has gained national attention from such publications as Bon Appetit, Gourment, The New York Times, Southern Living and Garden & Gun. Ashley was named one of the "Female Chefs of the Next Generation" by Bon Appetit in 2008 and is a three-time James Beard semi-finalist for Best Chef: Southeast." She has appeared on Food Network's popular series Iron Chef America and MCNBC's Your Business. 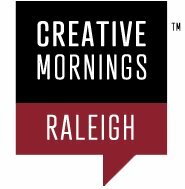 CreativeMornings are free, but you must pre-register to reserve your space through the Eventbrite: click HERE to register.